Don't just dump your empty jars in the recycling bin. 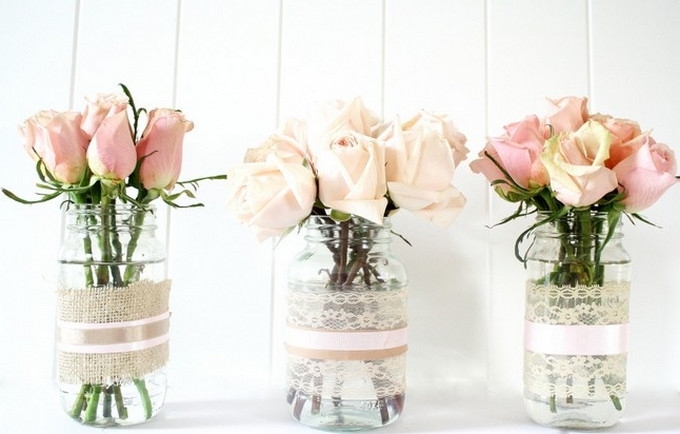 If you're wondering what to do with empty glass jars, you've come to the right place. Learn how to give empty jam jars, baby food jars or sauce containers a whole new lease of life with one of our many brilliant uses. You'll be shocked at what wonderful things you can do with them. Editor's Note: This post was originally posted in July 2015 and has been completely revamped and updated for accuracy and comprehensiveness in December 2018. 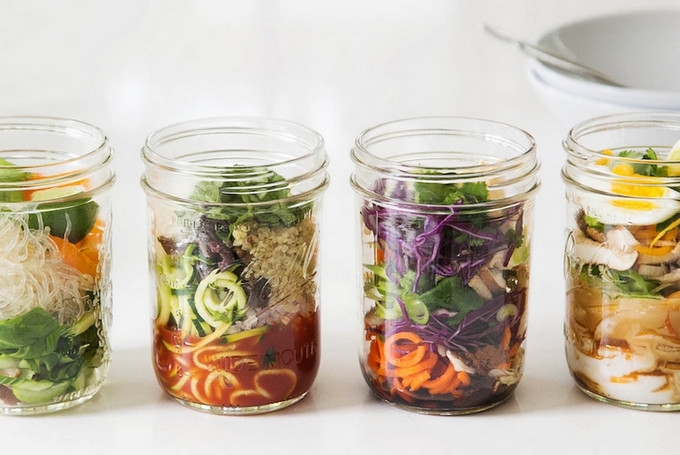 Before you get started, you'll want to clean and sterilise your empty jars. Either stick them in the dishwasher or dunk them in a bowl of hot, soapy water for a few hours. This will help get rid of any sticky labels too. Now your empty jars are all prepped and ready to go, it's time to get to the fun part - upcycling them into something new! Not only do they look cute and cheerful, but they're surprisingly practical too. 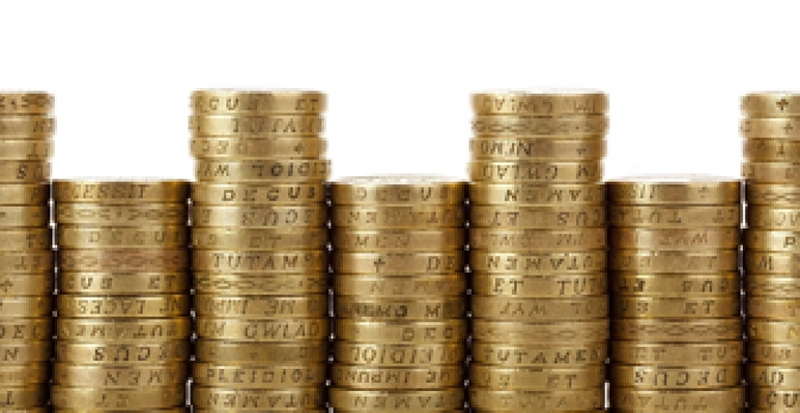 Plus, if you start collecting them early enough you'll save on costs! Serve with a retro umbrella and tie some ribbon around the neck for added kitsch. Don't have any ramekins to make individual desserts? 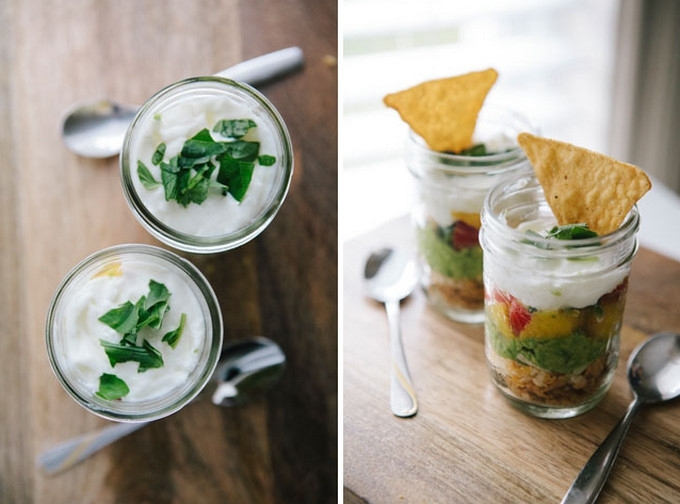 Grab those sterilised jam jars and make homemade trifles or other no-bake desserts. 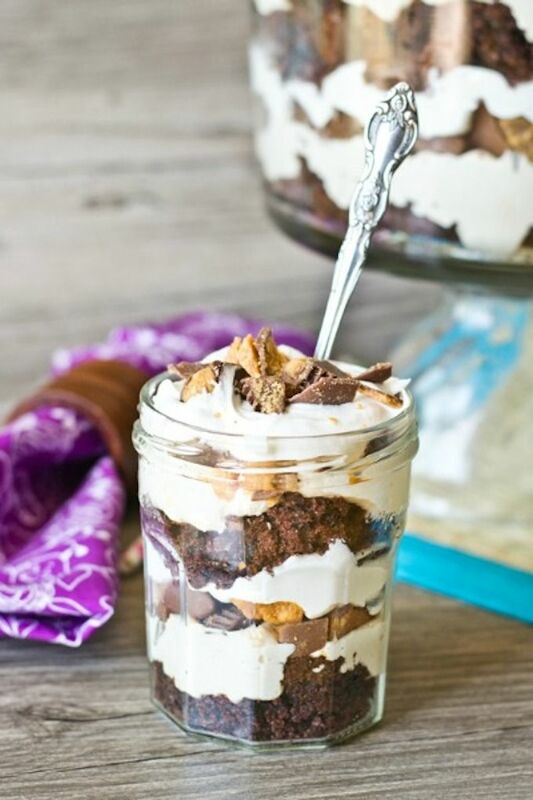 Taste Of Lizzy's peanut butter trifle looks absolutely divine - just don't forget to serve with a long dessert spoon! 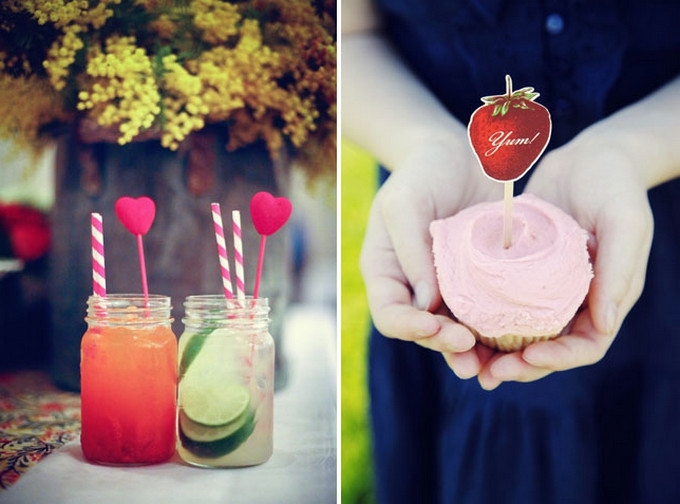 Avoid buying plastic bags and fill jam jars up with sweeties, tiny toys and other party favourites. You can also stick a plastic ornament on top and spray paint it to make a nice collectable they'll treasure forever. Who doesn't love hot chocolate - it's the perfect Christmas treat. 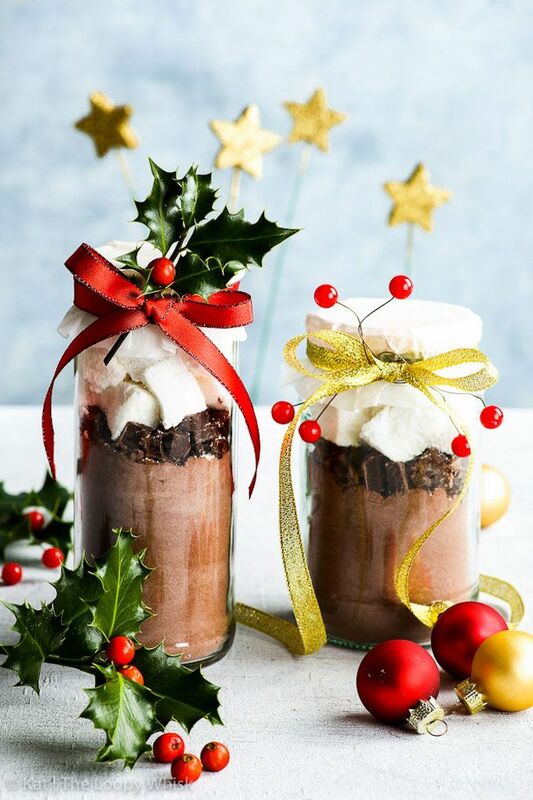 To give someone the gift of chocolate, fill up an empty jar with enough hot chocolate for two then top up with mini marshmallows. Attach a miniature bottle of Baileys to the lid using some twine and et voilà, a lovely little stocking filler. Did you know you could cook eggs in jars? Use your empty jar to poach an egg by cracking it in and placing in a saucepan of simmering water, making sure the water covers around three-quarters of the jar. Leave to cook for around 7-8 minutes depending on how you like your eggs. Easy! Forget using plastic lunchboxes - empty jam jars are the way forward! 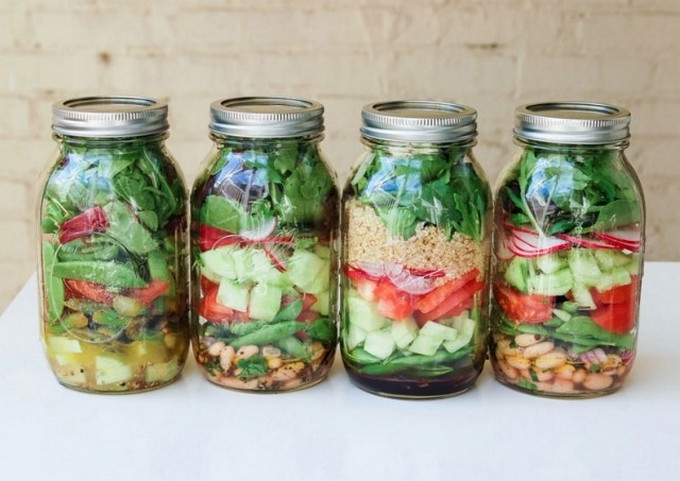 Take your lunch to work by filling a jar with salad, noodles, rice and whatever else fits. You can even make your own home-made cup of noodle soup - there are plenty of healthy and delicious ideas at Goop. 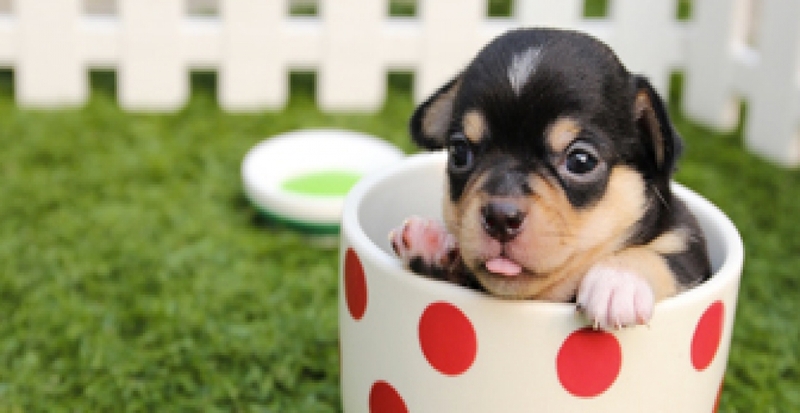 Got yourself a cookie jar? A supply of biscuits is essential in every household for when unexpected guests drop by. The airtight container will keep them fresh and they'll look pretty appetising too. 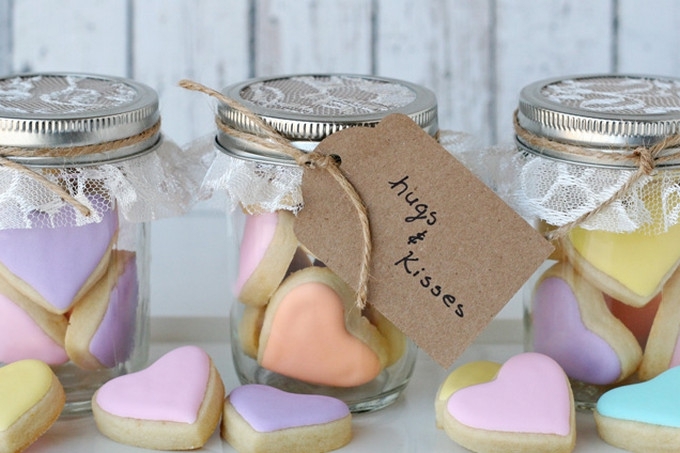 Alternatively, if you love to bake cookies as gifts why not beautifully present them in a jar a la Glorious Treats? Stack them with alternating layers of baking paper or simply fill to the top. Canning is a fantastic way to help preserve food for up to five years. 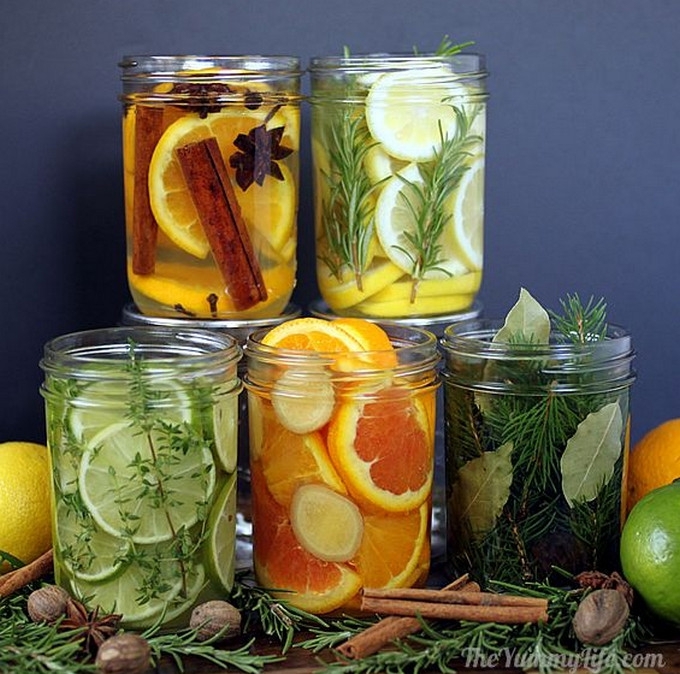 You can use your sterilised jars to keep anything from jams to sauces and even vegetables! Have a watch of the video above to learn how to can food yourself. 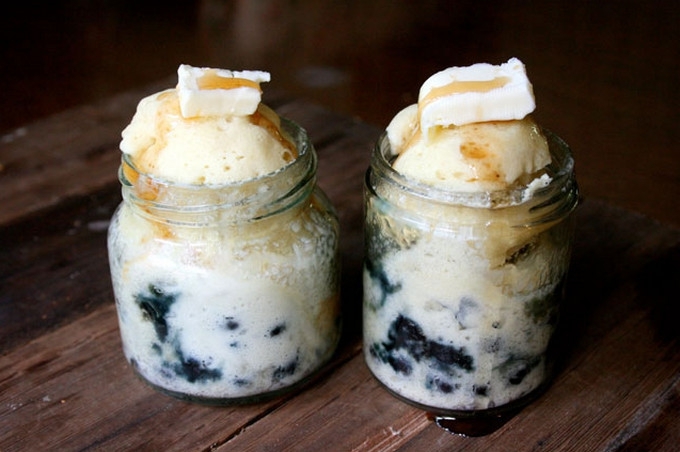 Who knew you could make pancakes in a jar? Follow this easy-peasy recipe from Boy & the Rabbit for a deliciously different weekend breakfast. 10. 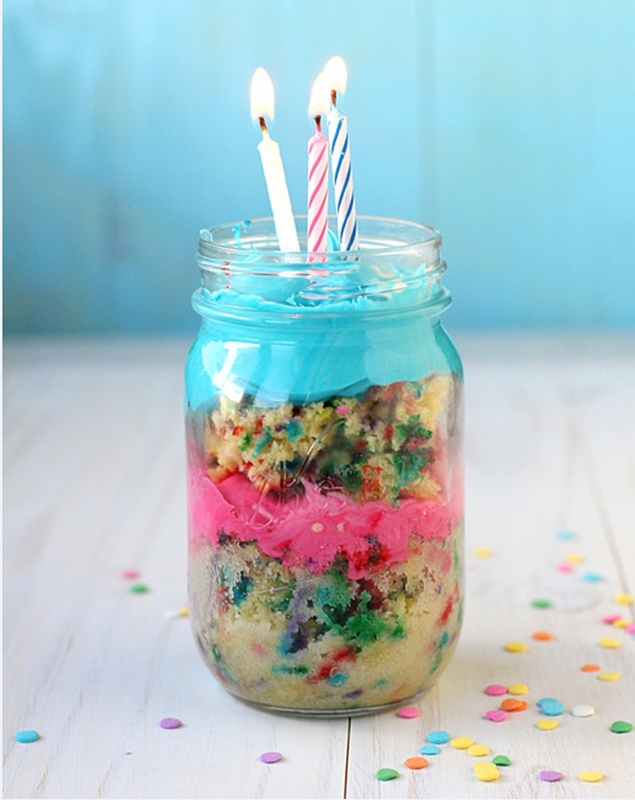 Or Birthday cake in a jar? This is a very sweet idea from Babble, especially if you've not got time to make a proper cake. Instead of buying a dry old cupcake, make your loved ones their own cake in a jar with just a packet of cake mix, ready-made icing, sprinkles and candles. A beautiful idea for when you don't have much time on your hands. It's not just humans that have a sweet tooth - ants love sugar too! If you have cupboards full of half-opened sweet treats, pop them into your empty jam jars to keep them from attracting ants. It'll also help keep anything from going stale. If you have some scraps of jam left in your jam jar (before washing) then simply top up with milk and stir for an instant milkshake! This simple recipe is surprisingly delicious and great when you want a sweet treat, fast. 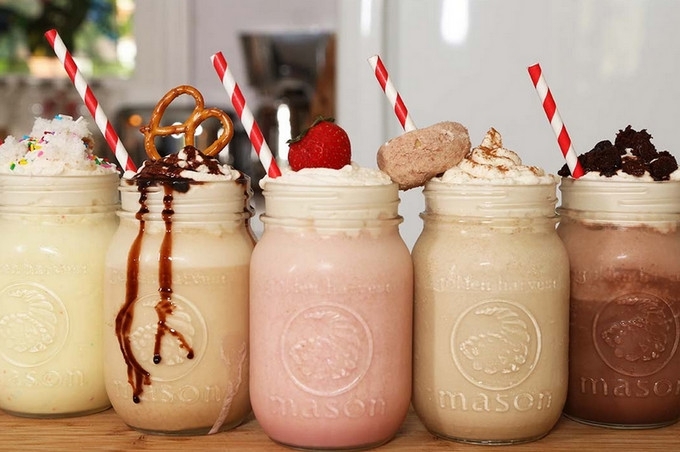 Check out 5 Outrageously Delicious Milkshakes for inspiration. 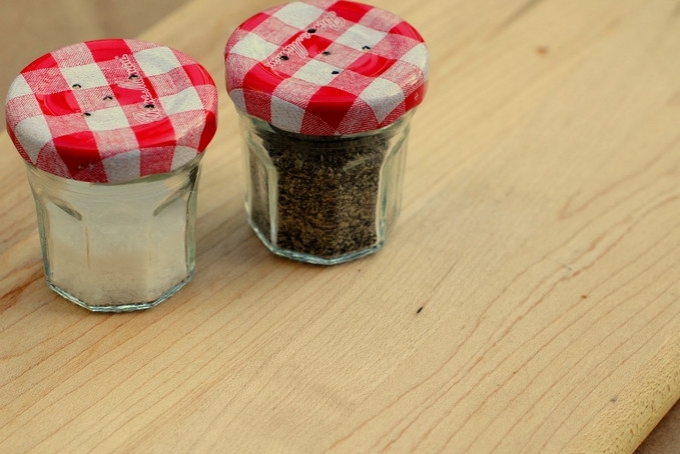 For a really cute addition to your dinner table, drill or punch small holes into jam jar lids to make your own herb or salt and pepper shakers. You can use small ones for your dining table and larger ones for easy cooking. They're perfect for cottagey kitchens. Learn how to make yous over at A Pretty Cool Life. Punch holes into your jam lids. Et voilà - your brand new salt and pepper shakers! 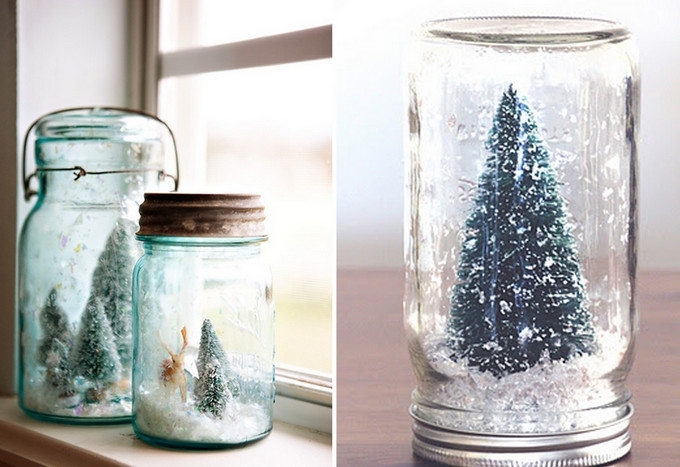 Harness the magic of Christmas time with a DIY snow globe. It's a fun yet easy crafting project for the kids and they make great gifts too. 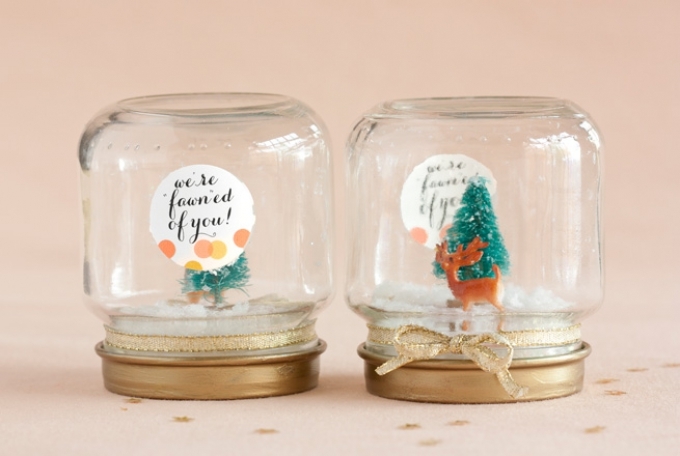 For a simple dry version, all you need are some empty jam jars, plastic ornaments (animals and trees make lovely scenes and are easily found in toy stores), super glue, fake snow and glitter. 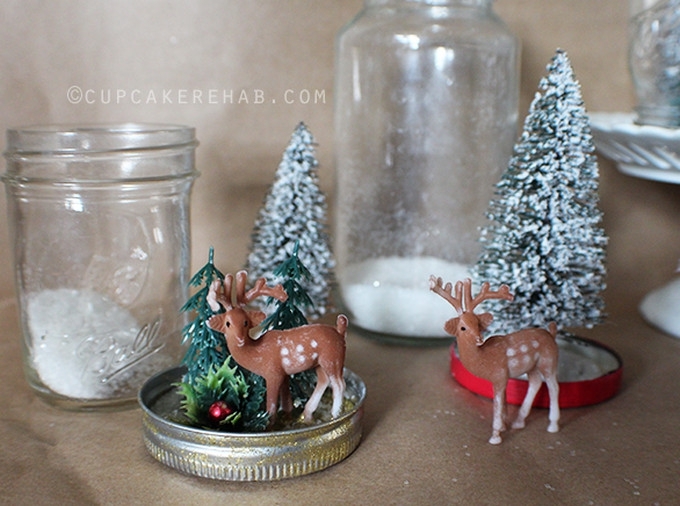 Glue the ornaments to the back of the lid, fill with snow and glitter then screw on - so easy! Homemade snow globes - Flat Broke Bride. 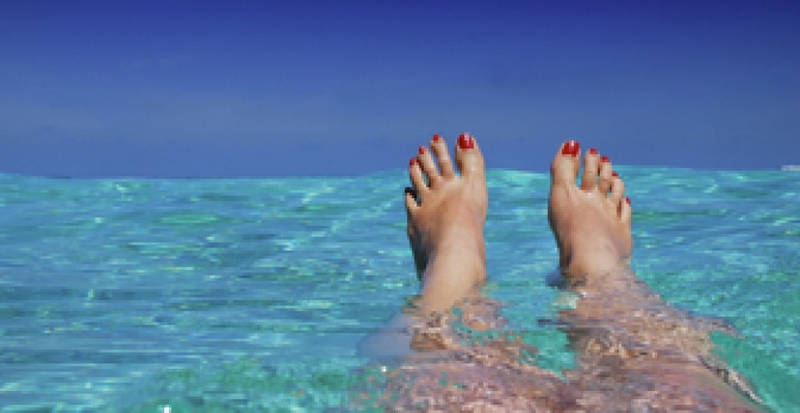 If you fancy having a go at a water version, then top with water and a few drops of glycerin or baby oil - this helps the 'snow' to fall instead of just sink. You'll need to make sure your props inside are waterproof and it's worth glueing the lids to the jars to prevent any leaks. 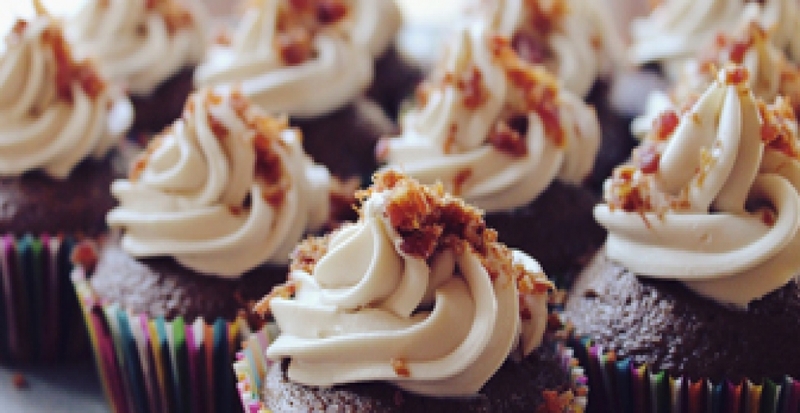 Cupcake Rehab has a really useful blog post on how to create both versions with lots of handy tips and advice. Empty jars aren't just for tea lights. 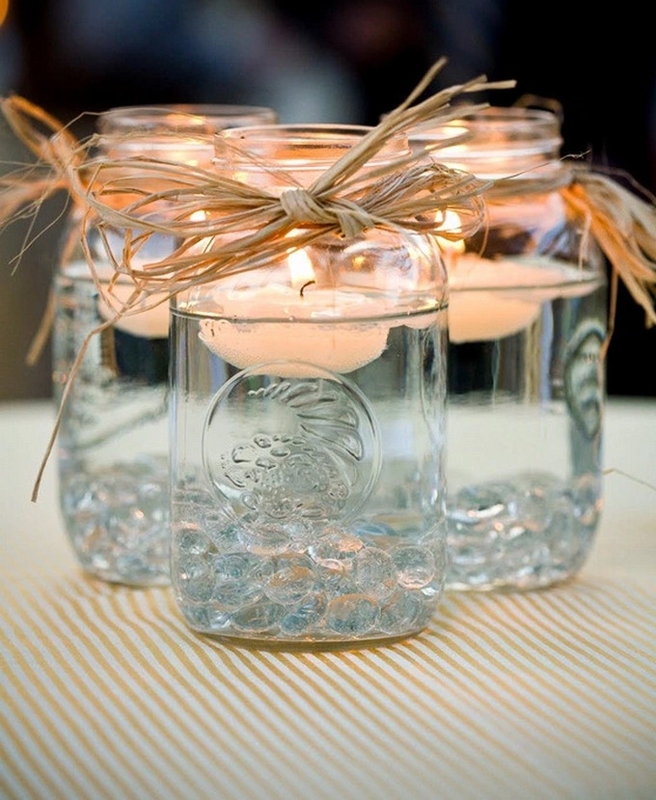 Fill empty jam jars with dry sand, sea salt flakes or small pebbles then place a long tapered candle in each. Decorate with ribbon or lace for a simple yet stunning centrepiece. Bring the outdoors inside and add some green to a dull workspace or tabletop. 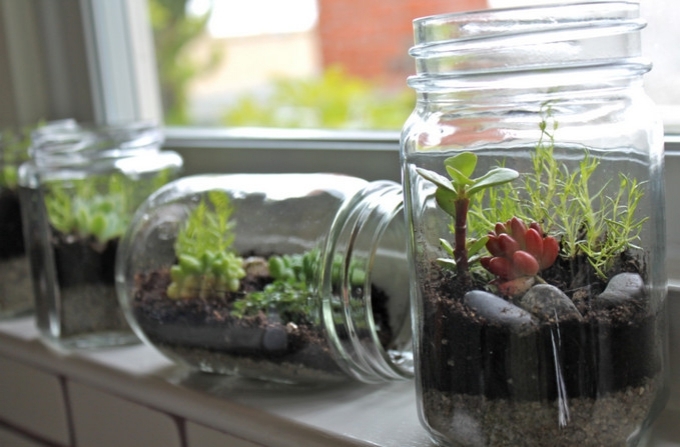 You can make your own tiny garden with empty jam jars, some dry sand, soil and cuttings from the garden. Check out the Sirona Springs blog for an easy tutorial on how to make these little wonders. Your own mini garden - indoors! Tea lights bring a touch of mystical magic to any garden party. 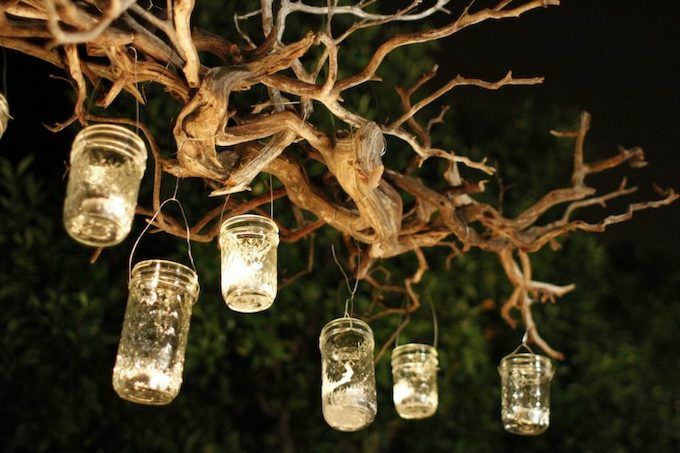 Now you can make them extra pretty by placing them in empty jars using twine from the branches of your trees. This is so simple yet so stunning, and a really cheap way to decorate your BBQ, birthday party or even wedding! There's nothing prettier than wildflowers arranged in a large, empty jam jar (or even a pasta sauce bottle). 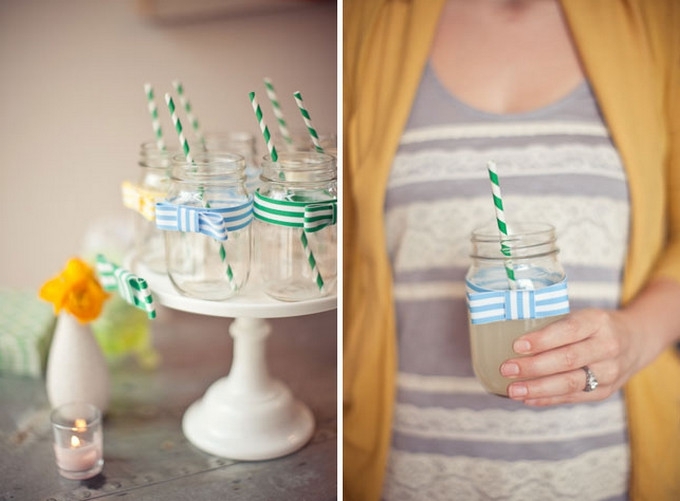 Style it like you stole it made hers look beautiful with just a few pieces of lace and ribbon tied around each jar. Line up three jam jars full of your favourite posies for a lovely windowsill display - these are another gorgeous wedding idea. 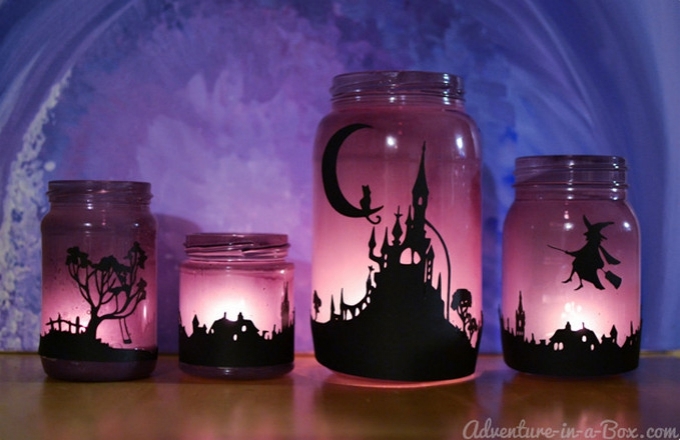 You could even paint your jars for a more dramatic effect. We love this next idea and know you will too! 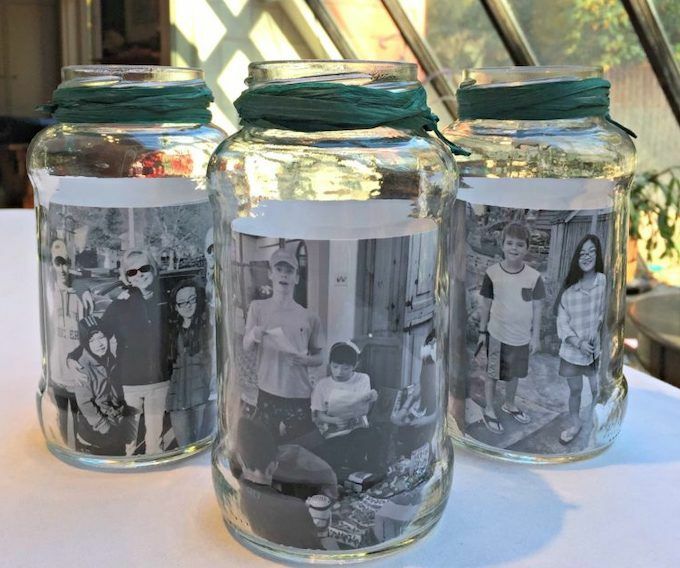 Jars are a really special way to display your favourite photos. Simply produce scaled-down copies and pop each into a jar. 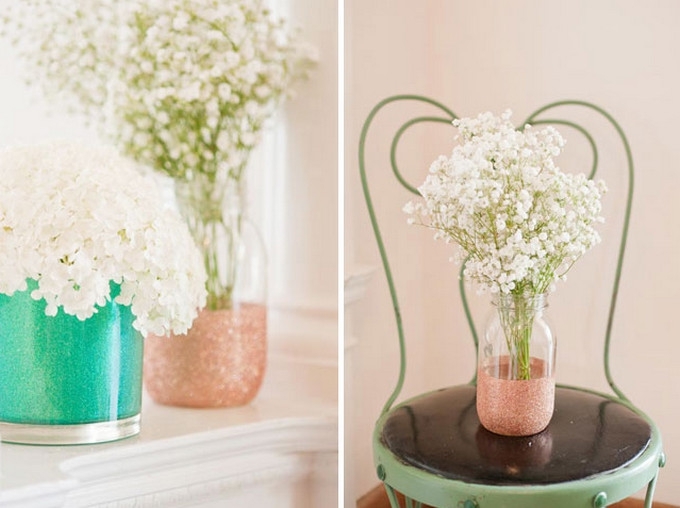 They're really charming and will add a vintage touch to any home. There's no need to spend a fortune on a pretty doorstop - all you need is a large empty sauce jar and the great outdoors to make your own. Fill the jar with heavy stones then pour in some dry sand to cushion the caps for a unique doorstop. Super glue an LED tea light to the inside of the lid and screw the jar back on for a nifty way to light up a dark garden path. You can also decorate your jar with sticky-back plastic to marvellous effect. 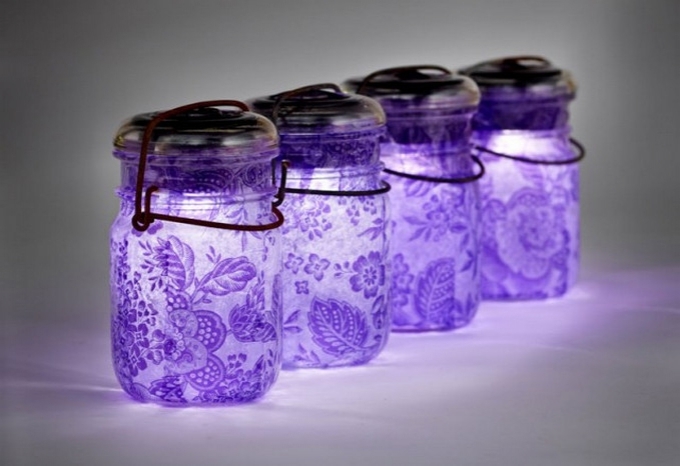 A large jar is all you need to make a magical home-made lamp. Fill one with a strip of battery-powered fairy lights and let it softly light up your bedroom. 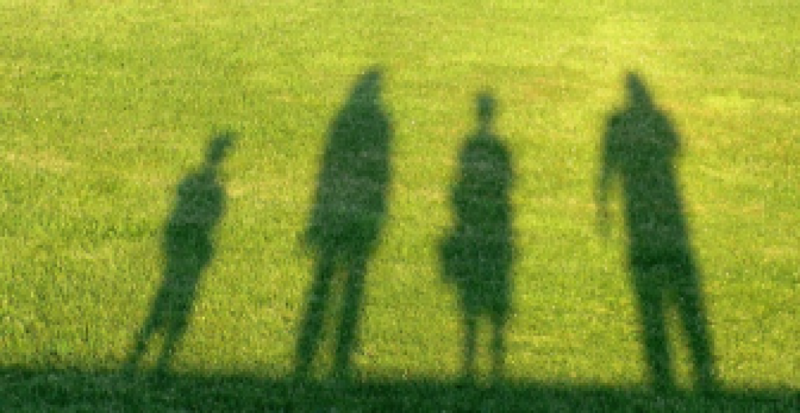 Here's another really novel idea to give a whole new look to your family photos. Get some translucent vellum paper from your and print some memorable photos onto them using your home printer. 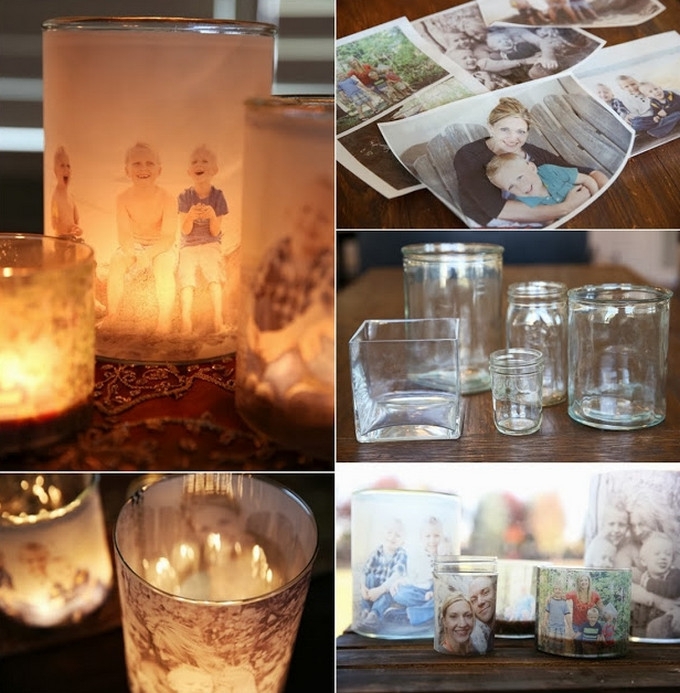 Trim and stick your photos to the inside of your empty jam jars and pop some candles inside for a beautiful glowing photo frame. For the full tutorial visit Our Best Bites. 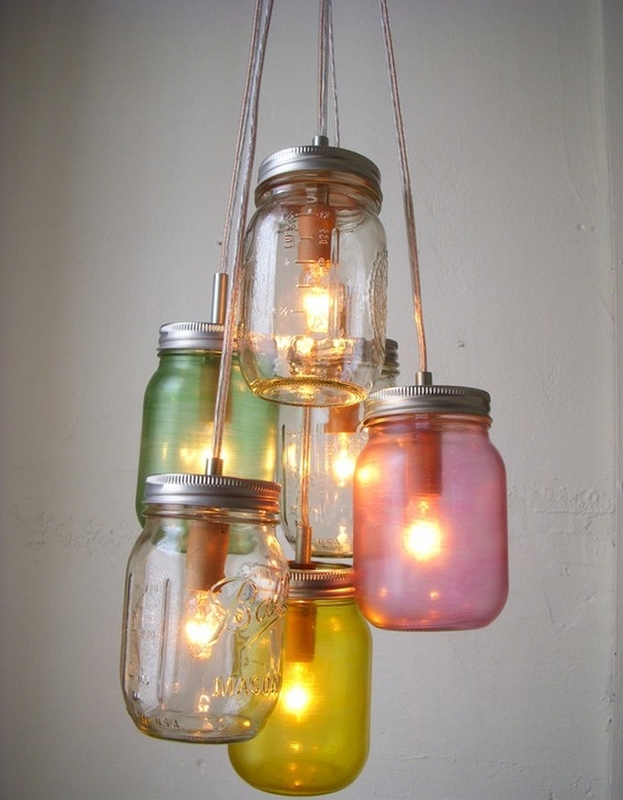 If you are handy with electrics then why not have a go at making your own jam jar chandelier? You can get most of the supplies from your local DIY store! Both Snapguide and Woon Blog have very useful guides to creating hanging pendant lights which are wonderful additions to any home. Like the vintage look? 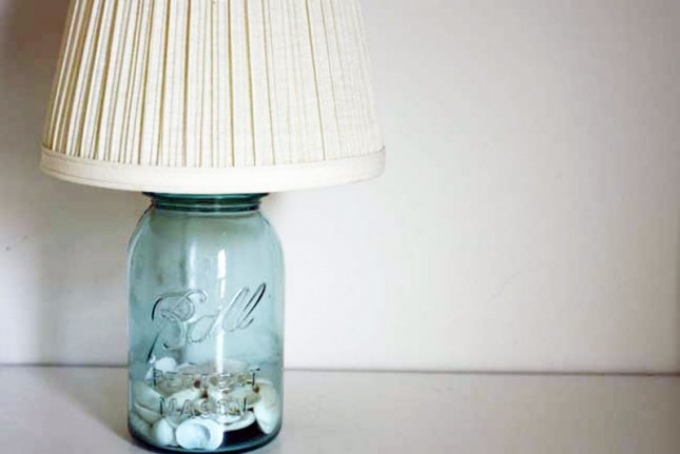 Find a jar big or small enough for your lampshade and fill with pebbles to give it some weight. Melissa Greetings will show you exactly how to create this very pretty seashell lampshade. Create your own lampshade base. Just because they start off clear, it doesn't mean your jars have to end that way. Draw pictures, patterns or write names on your jars using puffy paint (available from craft stores and e-retailers) then spray paint when dry. 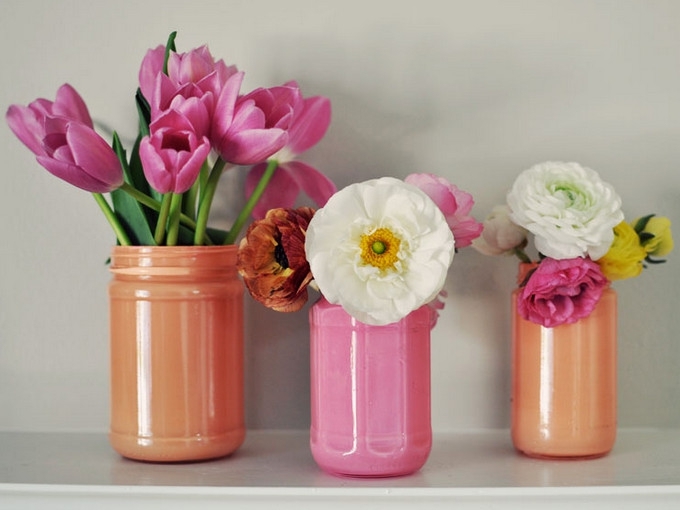 For a really modern twist, spray paint the inside of your jars for a glossy look à la Brit+Co. Metallic on the inside, glossy on the outside. Whether you're looking for a backdrop to say your vows in front of or to decorate your buffet table, you can create a beautiful scene using hanging jam jars. 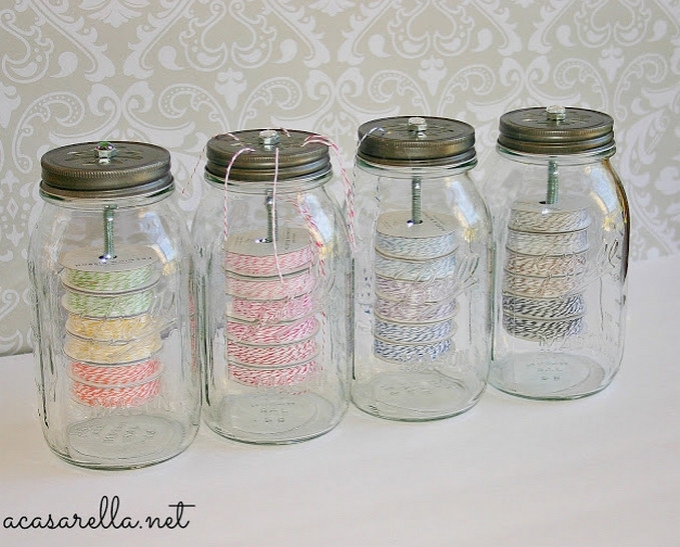 Grab some twine, decorate your jars, add candles if you like and hang them off of a rail. Say goodbye to expensive centrepieces! Fill your jars with water and pebbles, lay some floating candles on top à la Emmaline Bride and you've got a simple yet stunning centrepiece, ideal for barn weddings and Summer parties. 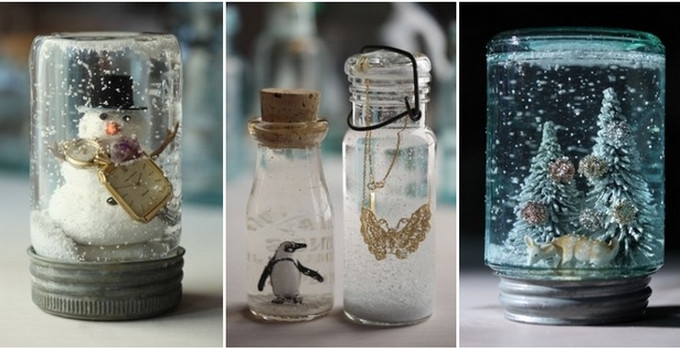 These jars can also be made into wedding favours. If you have lots of packets of spices in your cupboard or a few of the same bottles of herbs and spices, simply decant them into a jam jar. They'll be easier to organise, won't spill, ad they can look pretty nice displayed on a shelf too! Monogram lights are all the rage these days. 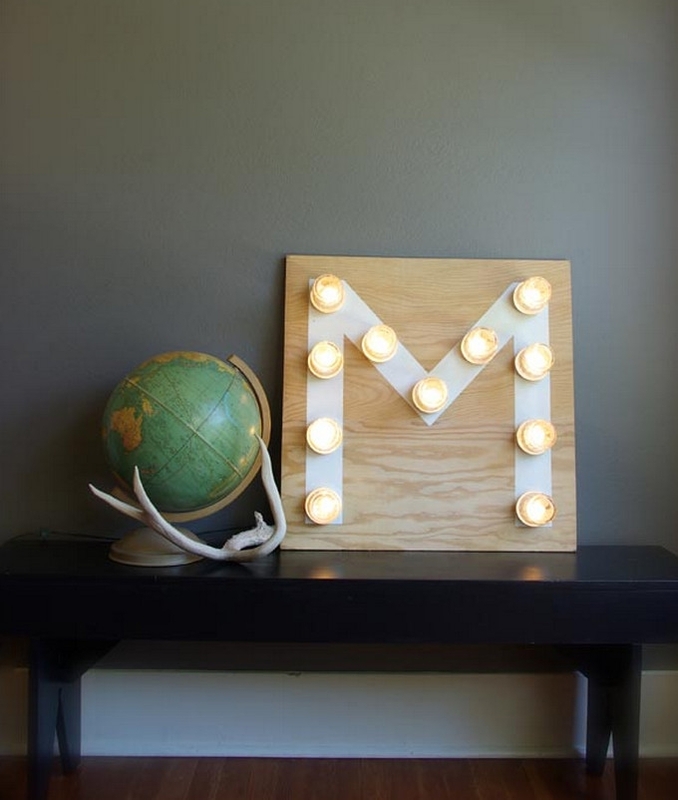 If you're handy with basic electrics or know someone who is, you can try your hand at making this Monogram light. 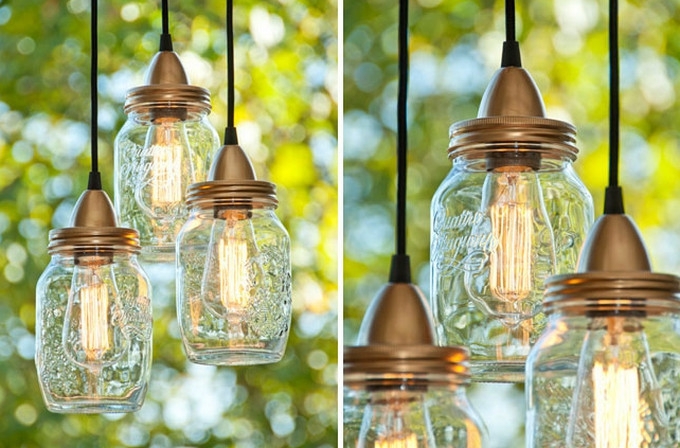 With just some wood, paint, small jam jars, light bulbs and wiring (all readily available at hardware stores) you can create your own little light. They're proving very popular at weddings so you could even make and give one as a unique wedding gift? Check out Oleander + Palm for all the details. Here's a super-fun idea for the kids. Get everyone involved filling up empty jam jars with coloured sand to create sand art. Pre-coloured sand is available at most craft shops and online retailers like Amazon. 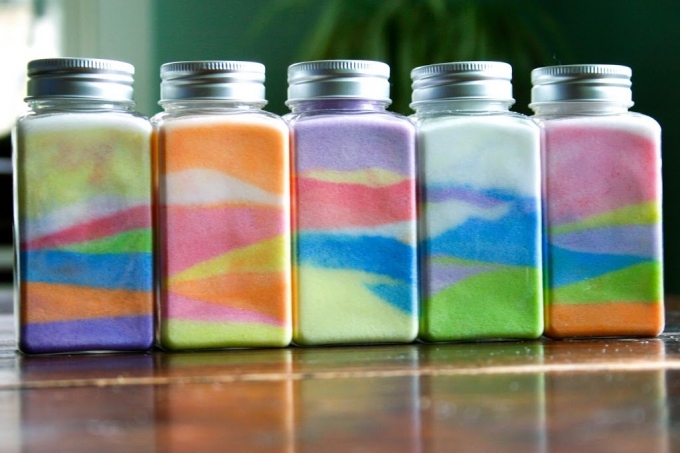 Alternatively, use salt and coloured chalk like Flax and Twine to create a simple rainbow effect. You can also experiment with different patterns. 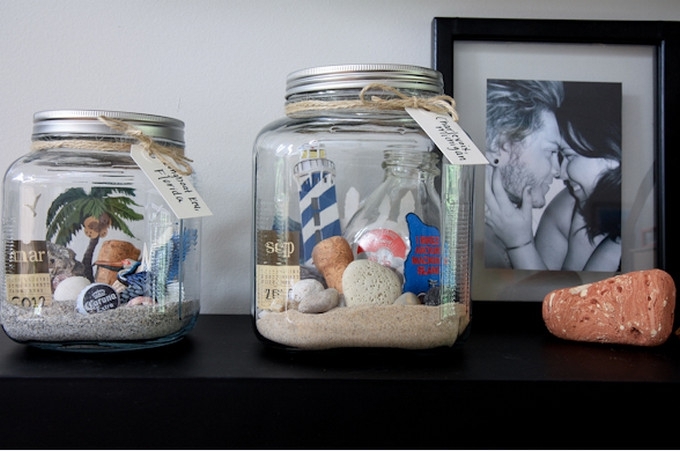 Memory jars are so wonderful and something you can treasure forever. If you've been lucky enough to go on a beach holiday, make your own little souvenir by filling a jam jar with some dry sand (transport it back home in taped plastic bags), seashells and pebbles, a home-made flag of the country (easily made with card and a toothpick) and your favourite photo from the trip. Alternatively, you can place a memory jar at a party or wedding for people to write sentimental notes in for you to discover and keep for years to come. Something to treasure forever - Broken Plow. Keep all your nail tools in one place! Store your nail file, buffer, top coat and cuticle stick in an empty jam jar to make them easily accessible when you need them. Alternatively, you can buy some nail tools for the beauty lover in your life and display them inside a jar along with a ribbon - it makes a lovely gift! 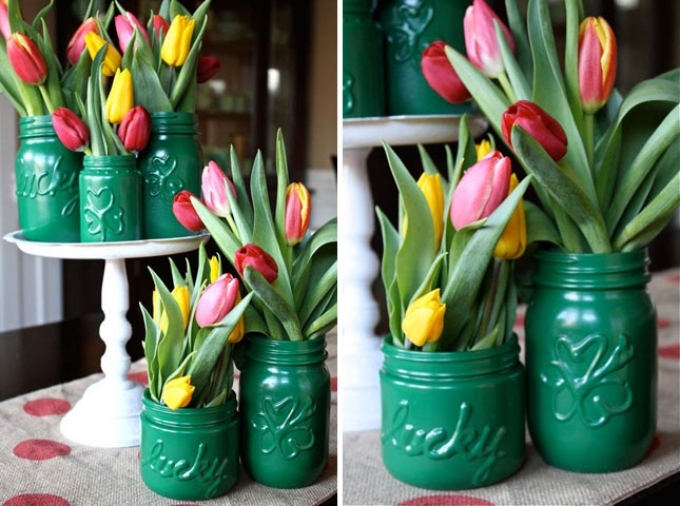 Here's another wonderful activity you can try with empty jam jars. Get the kids to write letters to their future selves and pop them into jars alongside some photos and trinkets then bury them in the garden. Once they're hidden, draw a map so they can relocate them in the future and dig up their time capsules. You've used the jars and now you have lots of lids going spare. Don't bin them as they can be up-cycled into something wonderful. Use them as cookie cutters when you're baking (the jar makes a pretty good rolling pin too) and as makeshift coasters. 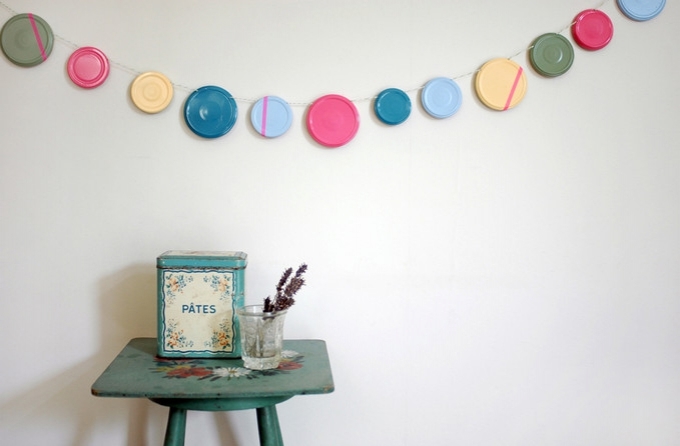 You could even make your own Jam Jar Lid Garland à la Caroline Rowland at ao life blog. It'll look really fantastic in the garden or hanging up in the kid's bedroom. So pretty and perfect for Summer. 36. 'Fairies in a Jar'. 'Fairies in a jar' we hear you say! Well, they're as magical as they sound, especially for the kids. Just grab your empty jars, some glow sticks and some glitter. Watch the video above to learn how to make yours. Just be warned - the light doesn't last very long (just a few minutes) so pre-warn the kids to avoid any disappointment. As far as we're concerned, it's all part of the fun! 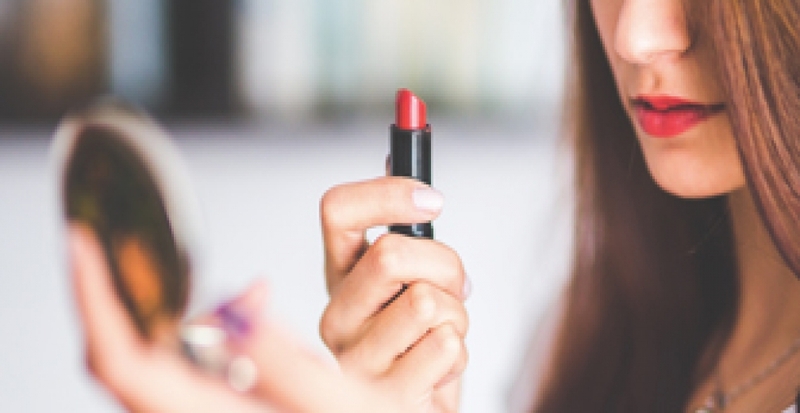 There are tons of homemade beauty product recipes out there, but where are you meant to store your finished product? Forget plastic containers - an empty glass jar will be much prettier on your bathroom shelf. You could even add a decorative ribbon and a gift tag to make this into a present. No Halloween is complete without some DIY decorations. For something different this year, swap your messy pumpkin for these spooky lanterns from Adventure in a Box. 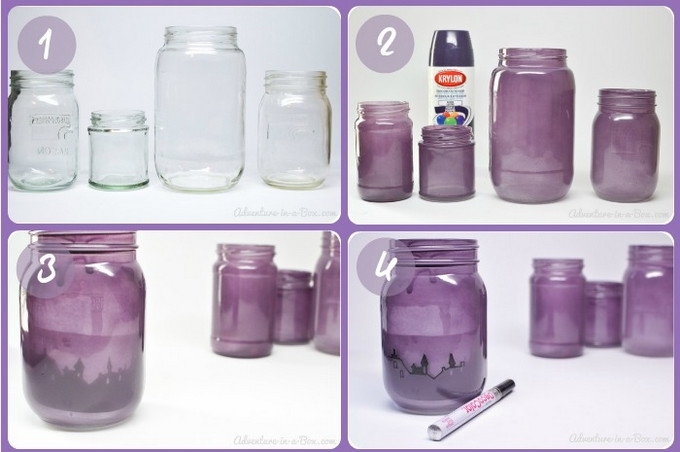 They're super effective yet really easy and all you need to make them is some spray paint, jars and a permanent marker (plus some candles to light them up). It's beginning to look a lot like Christmas, and no Christmas is ever complete without an advent calendar! They're pretty cheap to buy, but if you want to show your loved ones just how special they are, why not make a homemade advent using jars. Fill your advent calendar with whatever you like! 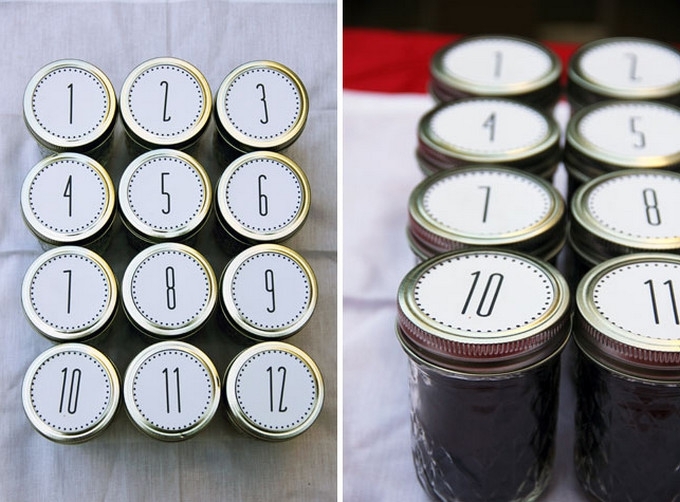 Just number your jars and glue them to a piece of wood or any other hard surface like a chalkboard. Check out Studio DIY for printable labels for your jars. 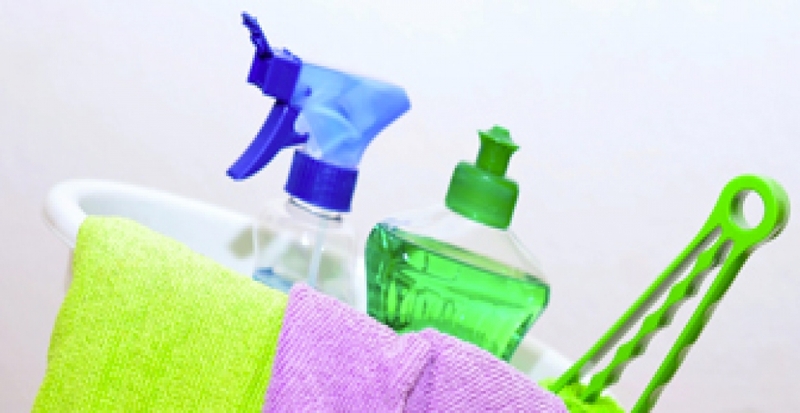 Keep your bathroom in order by storing cotton wool pads, bath salts and anything else, in separate glass jars. It'll also look a lot nicer than those plastic bottles that linger around the bathtub. DIY areas can soon get unruly. Keep your screws and nails organised by storing them in empty glass jars. You could even super glue the top of the lids to your garage shelves to save precious space. This one is a bit unusual, but genius for the golfers amongst you. If you're a keen golfer, keep all your tees where you can see them by popping them into a clean jam jar. 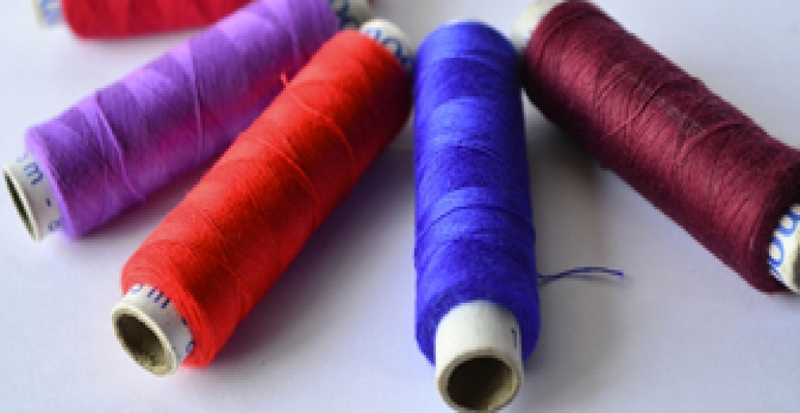 Love sewing? Those pesky pins can end up all over the shop if you're not careful. 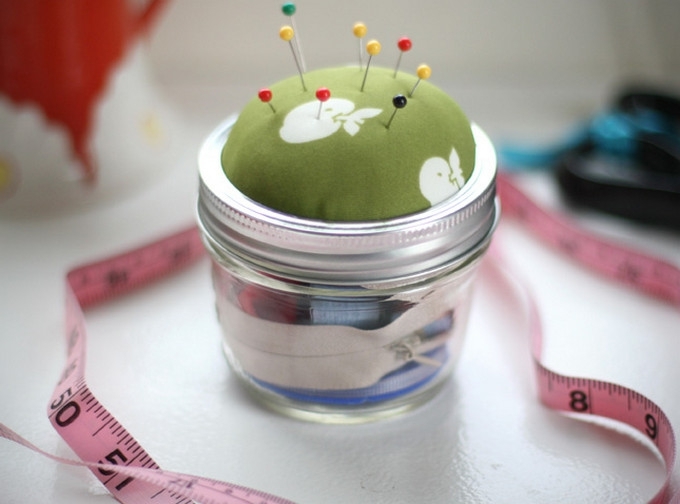 Whip up an easy peasy pincushion using an old empty jar to keep both your pins and other bits and bobs organised. Lulastic will show you how to make a handy little sewing storage jar with added pin cushions. It's very easy to do and makes a great gift for sewers! We just love this clever tip! 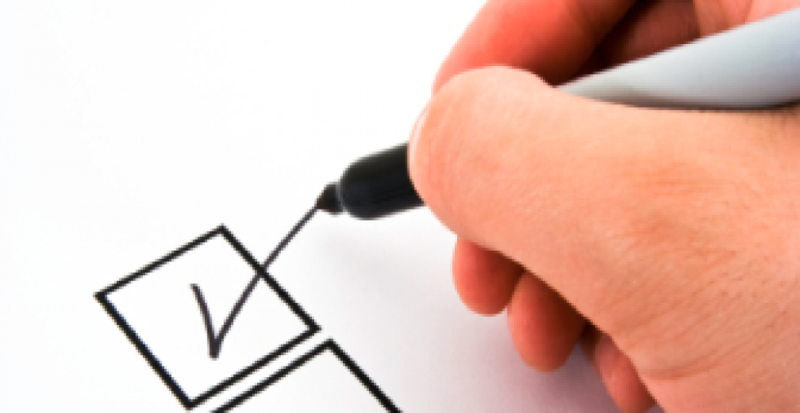 Measure how much liquid your jar can hold and use a permanent marker to mark the measurements down the side. It's very useful for when you only need to measure small amounts and a great kitchen space-saver! Got an electric drill? 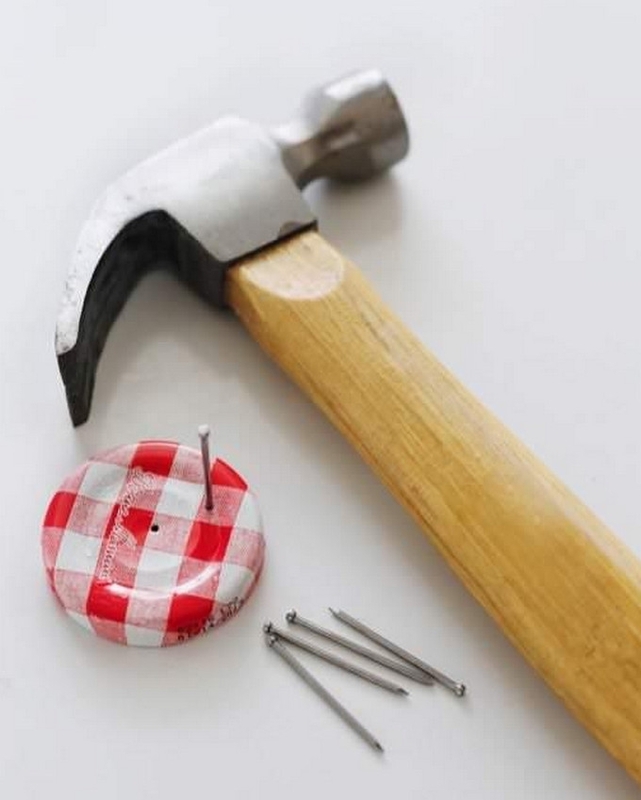 Make a hole in the centre of your jam jar lid the same size as a pencil sharpener, then glue it to the opposite side of the lid so it aligns with the hole. Screw your lid back onto the jar and use it as a handy pencil sharpener - all the shavings will be kept neatly in the jar until full. This is wonderful for teachers or during big craft sessions as it will save you from emptying the tiny sharpener pot every five minutes! Not only will they naturally fragrance your home for weeks but they're easy to make, you can use kitchen cupboard ingredients and they look pretty special, too. 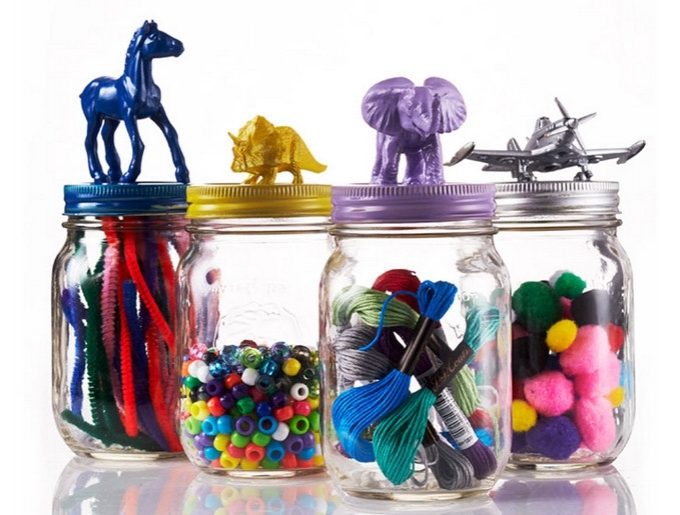 Save precious space by keeping your kids' - or your own - puzzle pieces in jam jars. It takes up less space than clunky boxes and they look pretty cute displayed on living room shelves too. Hang onto those teeny tiny mini jam and honey jars. With their tight seals, they work really well to store shampoo, conditioner and any other liquid products for your weekends away. Listen up, crafters! If you use twine a lot, you can create your own dispenser thanks to this fantastic tutorial by A Casarella. 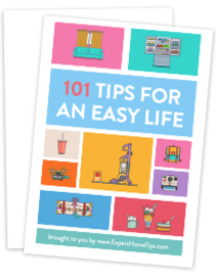 You will need to have a drill to hand and some hex bolts and screws, but they'll last you a lifetime and keep your twines and ribbon neat and tidy too. Or for something a bit simpler, punch a hole through your jam jar lid and thread your twine through. 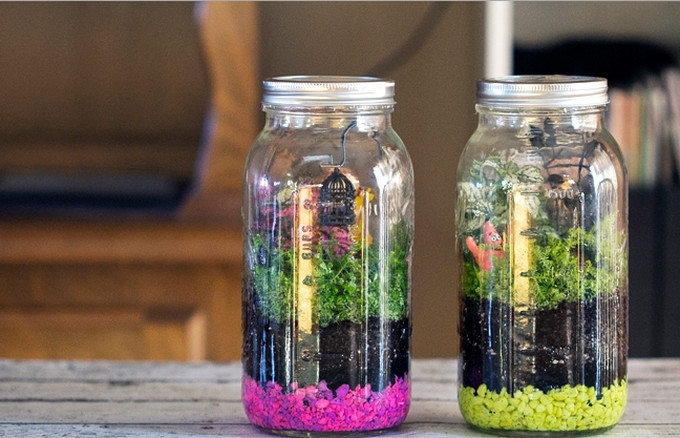 If you've got time, go the extra mile by painting and decorating your jars however you like. Empty jam jars are so useful for storage so should really never be throwing them away. Pop your kitchen utensils, cutlery, kids toys and beauty tools in them to keep areas nice and tidy. 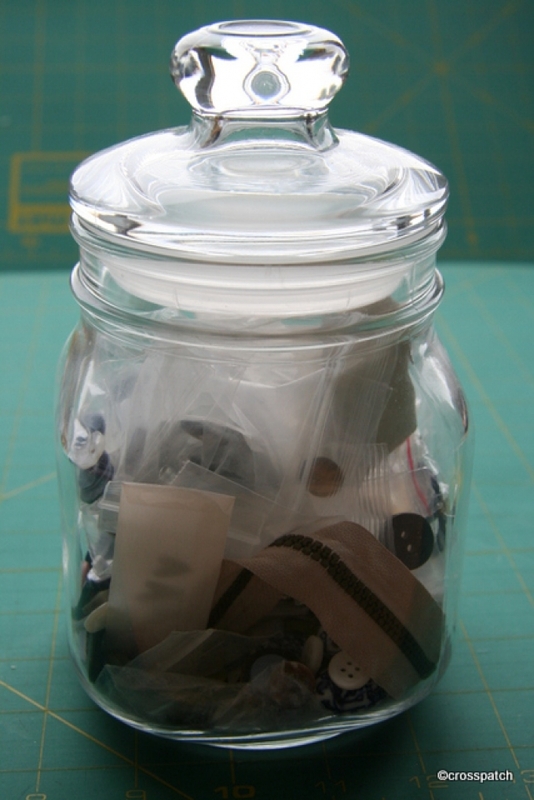 Store all your small bits and bobs in jars like SafeStore have done here. 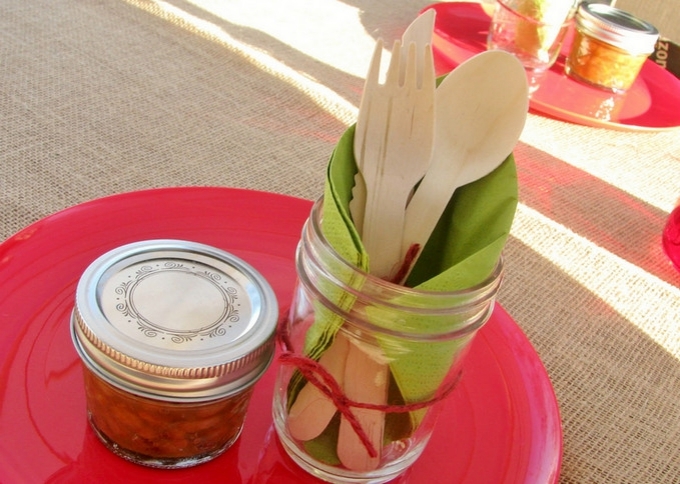 Make your guests their own place settings and for each roll up a napkin and place it inside a jar with their cutlery. You can also add extra items like a cracker at Christmas or a small bag of sweets for a wedding. These are particularly good for BBQs as they keep cutlery clean and out of the way. Why spend money on tea caddies when you can organise your teas into different jam jars. With some creative labelling, they could look even better than shop bought containers. If you're prone to tossing those little packets of spare buttons that come with new pieces of clothing, this one's for you. Put all those little packets in one jar so you know where they are in those button emergencies. Safe as buttons via My Cross Patch. When deciding what to do with empty jam jars, it's always best to make something practical, and there's nothing more practical than a DIY matchbox. All you need to make your own is a jam jar and some sandpaper. These are wonderful to keep outside to light candles during Summer, and also by the fire during Winter. Read The Burlap Bag blog for an easy-to-follow guide. 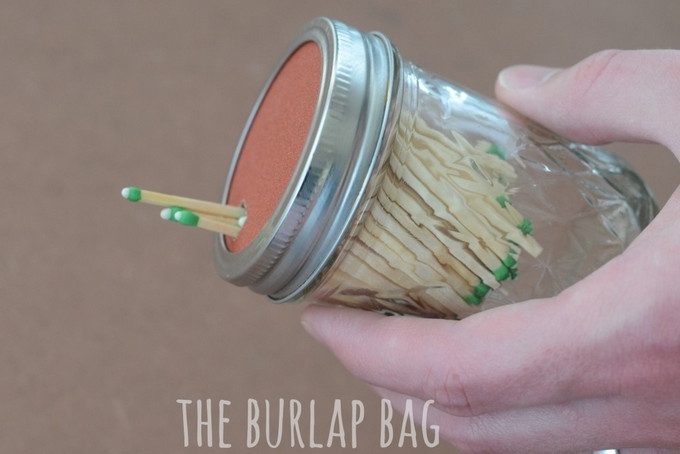 Strike it lucky with your own matchstick jar. 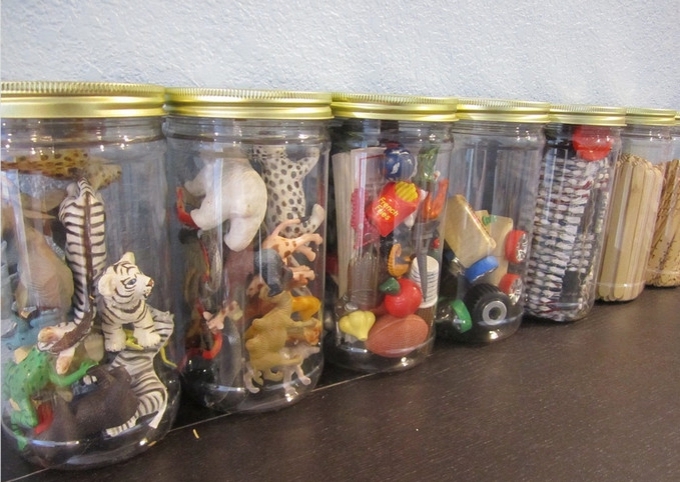 Here's a really nifty idea - super glue painted plastic toys to the top of painted jar lids and display them on your kid's shelves. You can keep all kinds of things inside them from lego to craft items. Use a variety of colours to make them really stand out. Here's a really nifty idea for tight spaces. You can attach jars to the underside of shelves with a few strong magnets or a magnetic strip. These are great in the study, and for storing spices and herbs in the kitchen too. It's also a great way to store bathroom bits underneath a cabinet. Fancy making your own soap dispenser? 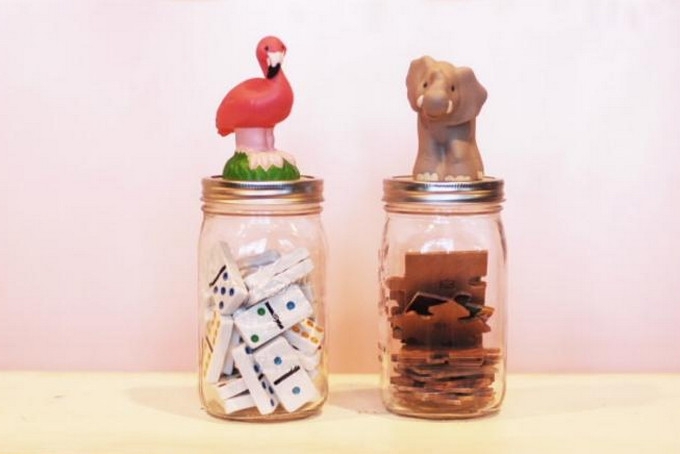 It's easier than you may have thought with a few alterations to an empty jam jar. Drill or punch a hole into the lid of your jar, pop a plastic pump through it (you can grab one from empty toiletries) and glue it in place. Et voilà - your own soap dispenser! You could make ones for shampoo and conditioner, too. Buying fresh herbs every time you cook can get pretty expensive - maybe it's time to try growing your own? 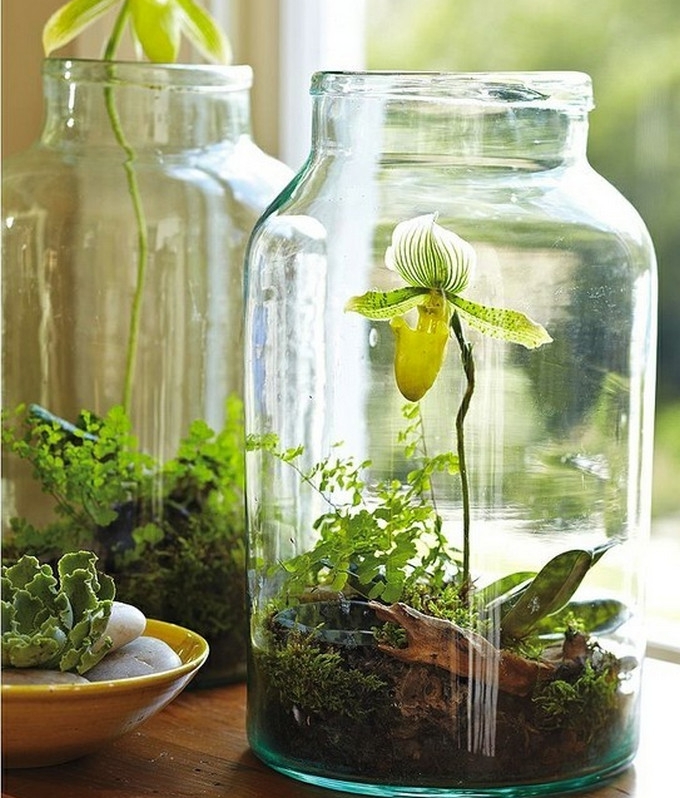 Grow them in jars and they'll look lovely sitting on your kitchen windowsill. 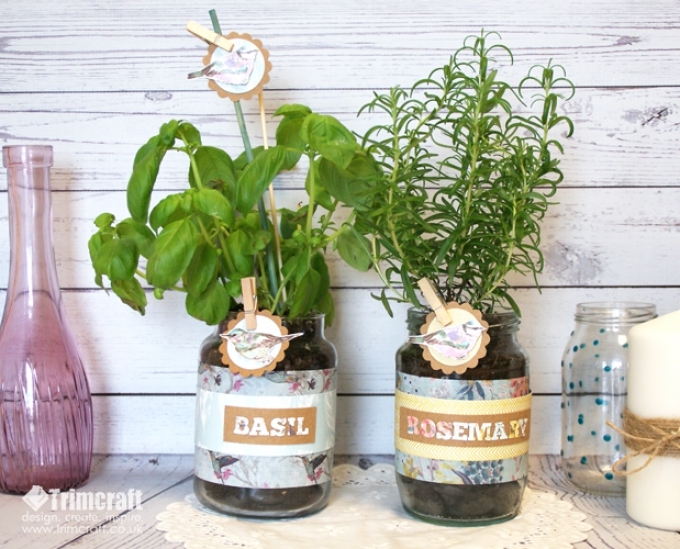 Check out the Trimcraft blog to learn how to make your own herb pots. You can even display them on your wall using some hose clamps, screws and a piece of wood. Checkout this great tutorial on how to make a wall herb garden. 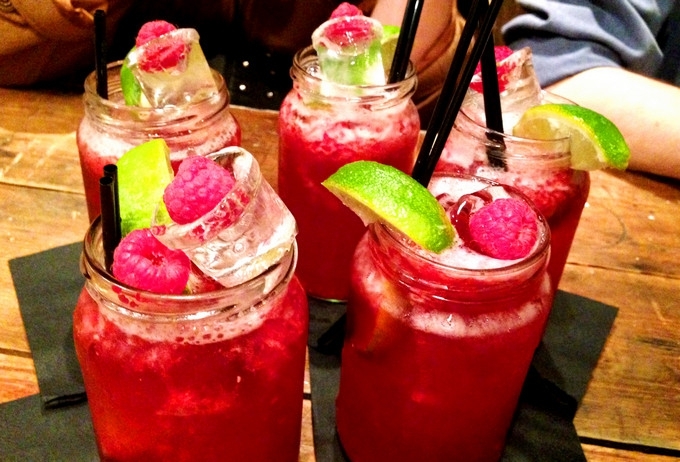 What's your favourite way to use jam jars? Share your ideas with us in the comments below! Keep chopped spring onions in a screwtop jar in the fridge.They keep fresh for ages don't make the fridge smell are quick and handy for garnish g plus the container does not absorb the smell like plastic ones.Saves on your smelly chopping board and fingers too! Great tips there Ross. I will definitely be trying this! As someone who both sews, and recycles jewellery, I have always used clear glass and plastic jars to store beads, cord, buttons, feathers etc. I have shelves of them and can find what I want easily. I recommend Coleman's mustard, peanut butter and coffee jars as they have screw tops. Jam Jars ideas - For several years I use my empty jam jars etc for a DIY task - when one has finished painting mainly gloss I pour some brush cleaner into the jar then then dirty brush and after a while one clean brush & I don't get paint splashing's all over the place. Great way to use empty jars Keith. Thanks for sharing this tip! I seriously like these and will be definitely trying some of them soon! Thanks Anushka! Oh fab! let me know how you get on. I am going to be making scenes in jars using sand, fake stones, grass and other items. I am wondering what is used to keep these items in place when moving or transporting them? I don't want these things to shift around. I know the figurines that I am using will be glued down but don't know what to use for the other items. I would glue everything down that you possibly can or use blue tack to keep them in place while you transport? Hi Anuskhka thank you for sharring your tips i have lots of empty glass jars i wondering what I could do with them as i like to recycle as much things as i can i will try some of these lovely things you have shared with us thanks alot Anushka from christine . Fantastic article! I live in a tiny apartment in Paris and try to buy things in jars rather than plastic packaging or aluminium (beans and the like...) as I have it in my head that jars are just so much more... useful. Then I end up with more empty jars in my kitchen than food and get to the point when I have to let some of them go. But after reading this, there's so much I can do with them! (And believe me I'm thrifty enough on my own!) Thanks so much! A craft weekend awaits! (Although one tiny point.. I know Mason Jars are super trendy and everything, but some projects just don't work for regular jars... But kudos to you guys for providing options for both! Hi Kim. No way - I also lived in Paris for two years. I'm very jealous of you and your tiny Parisian apartment :) I'm pleased you enjoyed the article and happy we could help you with some new ideas. Good luck trying them! And another small point... thanks so much for having a website that opens a new window when I click on a link! It means I can click and continue reading the article in peace and save the new tabs for later. Can't understand why more websites don't do this.... I've honestly stopped reading other sites just because of the lack of this function! Great post. 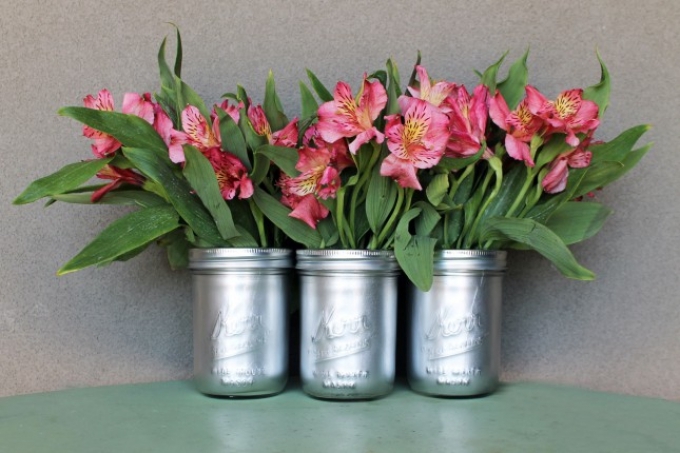 This is an awesome productive tricks for recycling empty bottles and jars. Thanks! We're glad you found it useful!